After the BJP government was established in the state of Uttar Pradesh, the authority has been on a welfare scheme implementation spree. It has created headlines with the announcement of the latest welfare program that targets the labor class and the betterment of their family members. 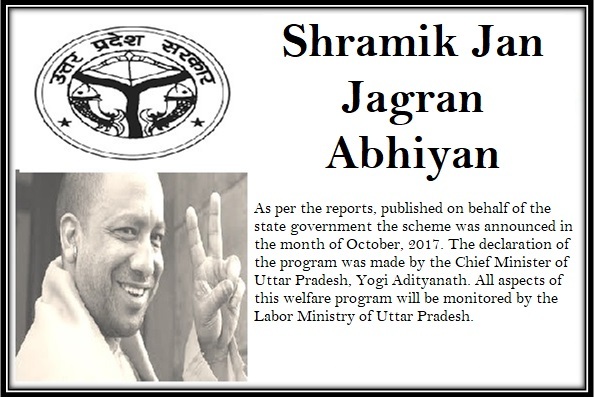 The name of the scheme is Uttar Pradesh Shramik Jan Jagran Abhiyan. As per the reports, published on behalf of the state government the scheme was announced in the month of October, 2017. The declaration of the program was made by the Chief Minister of Uttar Pradesh, Yogi Adityanath. All aspects of this welfare program will be monitored by the Labor Ministry of Uttar Pradesh. Empowerment of the labor class – The overall financial situation of the labors, working in the unorganized sector in the state is not very good. With this multi-faceted scheme, the authority wants to bring about betterment in their lives. Covering various aspects of life – The main objective of the state government is to give financial and social security to the labor class. Thus, various aspects of life will be catered to via this scheme. Construction and other sectors – The people, who work in any construction site or are employed in any other unorganized sector as labor, will get the facility of getting their names registered under the scheme. Providing financial assistance – The state government will try to assist the labors and the family members with monetary grant. These grants will be given on various grounds, starting from educational and marriage related expenses to compensation after death. Arranging for mass marriage – The state government will assist the registered labors to get their daughters married. The state will organize mass marriage functions and the daughters of registered candidate will get married here. Providing security to the family – The family members of the registered labor will receive monetary assistance after the accidental or normal demise of the main earning member. Providing midday meals at low cost – Apart from the monetary assistance for the labors and their families, they will also be provided nutritious food at Rs 10 per day. The midday meals will be given in all ten cities for the time being. Schooling near construction site – The children of the labor families will get admission in schools, which are located near the construction sites where their parents work. Funded by the state – The state will be responsible for meeting the financial requirements of the implementation of the program. Funds will be allocated during the declaration of the state budget. Bank account is mandatory – No matter under which section the labor family is receiving the monetary benefits, all transactions will be done via the bank accounts. Thus, all interested candidates need to have access to active accounts. Financial gift during the daughter’s marriage – Apart from organizing mass marriages, the state will also provide each bride with a gift of Rs.55, 000. A cheque will be handed over to the bride on the day of the marriage. Financial assistance for housing – As per the declaration of the state authority, each registered labor, who has no home of their own will be provided with financial assistance, amount to Rs 1 lakh. Financial assistance under Child Benefit program – Each registered candidate will be provided with a certain sum for taking better care of the child. The family will receive Rs. 15, 000 and Rs. 12, 000 on the birth of a female and male child respectively. Money for securing the future of a female child – The UP state government will deposit an additional amount of Rs 20, 000 in the bank, if a girl is born in the family of the labor. The girl will be allowed to withdraw the money once she reached the adult age of 18 years. Assistance for acquiring higher education – As per the guidelines of Sant Ravidas Education Help Scheme, the children of the registered labor will be rewarded with Rs. 60, 000. The amount must be utilized for pursuing higher education. Monthly scholarship to the children of the labor – As per the guidelines of the Education Help Scheme, the state will provide a monthly monetary grant of Rs. 100, Rs. 150 and Rs. 200 for primary, junior and secondary level of education. The graduation level students will receive Rs. 250 on a monthly basis. Monetary assistance for engineering candidates – If the children from the registered labor families get admission in any engineering course, they stand a chance of receiving monetary assistance of Rs. 5000. Assistance during death and funeral – If the registered labor dies on site in any accident, then the state will give the family a onetime amount of Rs. 5 lakhs. In case of natural death, the family will be given a compensation of Rs. 2 lakhs. To take care of the crematorium services, the each registered family will get Rs. 2, 000 from the government. As the scheme was launched in the recent times, the state has not yet announced all details about its eligibility criteria. But it is certain that only the residents of the state, with access to proper Aadhar Card and Voter ID card will be able to get their names registered under the scheme. How to get application form and apply for the scheme? Only construction and other forms of labor will be able to get the benefits of this scheme. The draft highlights that these workers must fall in the age bracket of 18 and 30 years. The state authority will organize camps in all gram panchayat areas. Interested individuals must get to these camps and attain their enrollment forms. It is necessary for the applicants to work for at least 90 days during the last financial year. The applicants must also mention in the application form that they are not associated with any other welfare society. It is also necessary that all applicants are carrying their employment papers, photocopy of Aadhar cards, and three recently clicked passport snaps. These will be attached with the enrollment form for background checks. The applicants will have to pay Rs. 25 as the enrollment fee, and Rs. 32 will be charged as the e-Mitra fee. This is a one-time-fee that he/she needs to pay. Once the registration is complete, applicants will have to pay Rs. 12 each year under this scheme. With the implementation of the scheme, the labor class of the state will get the social and financial security that they deserve. With the development of the grassroots classes, the overall status of the state will be enhanced.